Definition at line 25 of file DependencyOutputOptions.h. Definition at line 67 of file DependencyOutputOptions.h. Add missing headers to dependency list. Definition at line 32 of file DependencyOutputOptions.h. Referenced by clang::DependencyCollector::attachToASTReader(), clang::DependencyFileGenerator::CreateAndAttachToPreprocessor(), and ParseDependencyOutputArgs(). Definition at line 61 of file DependencyOutputOptions.h. Referenced by clang::CompilerInstance::createPreprocessor(), and ParseDependencyOutputArgs(). A list of filenames to be used as extra dependencies for every target. Definition at line 55 of file DependencyOutputOptions.h. Referenced by clang::AttachHeaderIncludeGen(), clang::DependencyCollector::attachToASTReader(), and ParseDependencyOutputArgs(). This is orthogonal to ShowHeaderIncludes (-H) and will include headers mentioned in the predefines buffer. If the output file is "-", output will be sent to stderr. Definition at line 48 of file DependencyOutputOptions.h. Definition at line 33 of file DependencyOutputOptions.h. 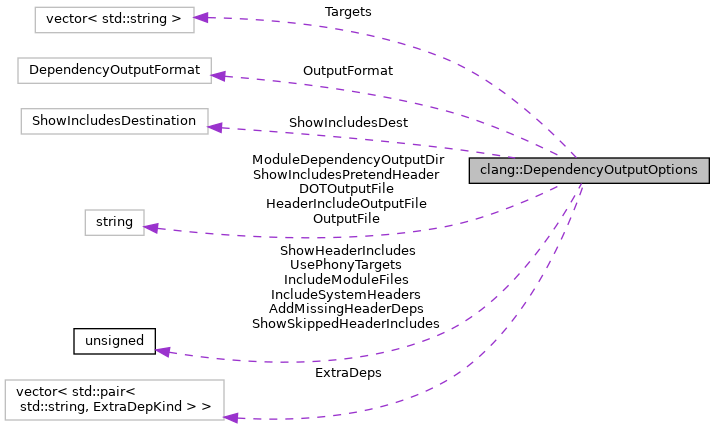 Referenced by clang::DependencyCollector::attachToASTReader(), and ParseDependencyOutputArgs(). Definition at line 27 of file DependencyOutputOptions.h. Definition at line 64 of file DependencyOutputOptions.h. Definition at line 42 of file DependencyOutputOptions.h. Referenced by clang::DependencyCollector::attachToASTReader(), clang::CompilerInstance::createPreprocessor(), and ParseDependencyOutputArgs(). The format for the dependency file. Definition at line 39 of file DependencyOutputOptions.h. Definition at line 28 of file DependencyOutputOptions.h. Definition at line 36 of file DependencyOutputOptions.h. Referenced by clang::AttachHeaderIncludeGen(), clang::CompilerInstance::createPreprocessor(), and ParseDependencyOutputArgs(). In /showIncludes mode, pretend the main TU is a header with this name. Definition at line 58 of file DependencyOutputOptions.h. A list of names to use as the targets in the dependency file; this list must contain at least one entry. Definition at line 52 of file DependencyOutputOptions.h. Include phony targets for each dependency, which can avoid some 'make' problems. Definition at line 29 of file DependencyOutputOptions.h.